The Vedas say that God does not take birth. The Bhagavadgita says God takes birth. What is the truth? If God takes birth, why do the Vedas say the opposite? There is no contradiction between the Vedas and the Bhagavadgita. In many ways, the Bhagavadgita is a summary of the Vedas, the Sutras, and the Upanishads. Hence, it is considered one of the most important scriptures of Hinduism. The Bhagavadgita brings the esoteric God of the Vedas into direct focus and presents him to the human mind in a relatable and tangible way. The God of Hinduism is a complex being, who is popularly known as Brahman but goes by many names. He is both the absolute and relative, is and is not, being and non-being, existence and nonexistence, one and many, visible and invisible, with form and without form, free from duality and subject to duality, and so on. In the same manner, he is both the born and the unborn. In the following discussion, we focus upon whether the God of Hinduism takes birth, and if so under what circumstances. Brahman is the highest deity of the Vedas who is frequently mentioned in the Upanishads as the ultimate or the highest goal (Parandhama), the Cosmic Being (Purusha), the Creator (Karta), the First (Adi), the Most Ancient (Anadi), the Infinite (Ananta), the Ordainer (Vidhata), the Supreme Lord (Parameswara), etc. He is what we understand as God, but in some respects different from the God of Abrahamic religions. When he is awake, he is existence (sat), but nonexistence when he is asleep. The default state of Brahman is Nirguna or the state without qualities and attributes. The Upanishads suggest that Brahman cannot be known entirely, or clearly, because his known aspect is much smaller than his unknown aspect, which even gods cannot fathom. Therefore, you may think you know him, but in truth do not know him at all. Since he is complete and absolute, you cannot say he is only this or that. Since he is the support of all, he is in everything and everywhere, pervades both good and bad, and light and darkness, but remains untouched by the things he pervades. The Brahman of the Upanishad has no birth, because he is without a beginning and without an end. Since he is the source or the womb of all, there is nothing other than him. (If you want to know about Brahman, please read my book Brahman). Isvara is Saguna Brahman, or Brahman with qualities and attributes. While Nirguna Brahman is indistinguishable and indescribable, Saguna Brahman or Isvara is a reflection of him in the purest aspect of Nature. In Nirguna Brahman, Nature (Prakriti) remains dormant and inactive as the primordial soup, without any distinguishing features. In contrast, in Saguna Brahman, Nature becomes dynamic and acts as his active agent, aspect or force of creation, preservation, change and transformation. While Brahman has neither a beginning nor an end and is unborn, Isvara, as the Being or the Person (Purusha) is self-born, with a beginning and an end. He manifests at the beginning of creation as the Lord of the universe, with specific functions of creation, preservation, destruction, etc., and lasts until its end. As the Supreme Being, with dynamic Nature as his active aspect, he acts as the Supreme Lord of Creation. As the personified Brahman, he has movement, corporeality or materiality, purpose, state, energy, duties, aspects, forms and powers to express his will and manifest the worlds and beings. The material universe is his body. In the created worlds, he becomes many, and participates in them as the enjoyer and the enjoyed, the God and the devotee, and the knower and the known. His highest manifestations are Hiranyagarbha (cosmic egg or seed), Viraj (cosmos), the Trinity (the three impelling life forces of creation, preservation, and destruction), Time (Kala), heaven, the mid-region, the sun and the moon, constellations, gods, celestial beings, etc. His lower manifestations are the earth, humans, animals, creatures, insects, demons, demonic worlds, etc. All these are part of his beingness, just as the various parts in your body are a part of your beingness. Brahma, Vishnu and Shiva are the triple aspects of Isvara. Hence, they are also known as Trimurthis (the three-forms). They represent the functional aspects of Isvara. Brahma is responsible for creation, Vishnu for preservation and Shiva for destruction. In their purest state, they are Isvara himself and indistinguishable from him, but in their functional states they act as independent deities. Hence, the three are worshipped by devotees both as Brahman himself and as separate divinities. Each God is associated with a specific aspect of Nature. Metaphorically, Brahma is associated with the mind of Isvara, Vishnu with his soul and Shiva with his body. Each of them is also associated with a particular Guna, or mode of Nature. Brahma is associated with Rajas, Vishnu with Sattva and Shiva with Tamas. Each of them in turn has numerous forms, aspects, associate deities and emanations. For the devotees, Isvara is an abstract or conceptual reality beyond the reach of the human mind, but the triple gods are revered as personal gods, and their images are installed in temples for ritual worship. As the supreme gods of creation, they have a beginning and an end. They are immortal only in the sense as Brahman. Although they do not have a physical birth, as the divinities with materiality and beingness they have a limited existence, manifesting from Isvara at the beginning of creation and becoming withdrawn at the end. 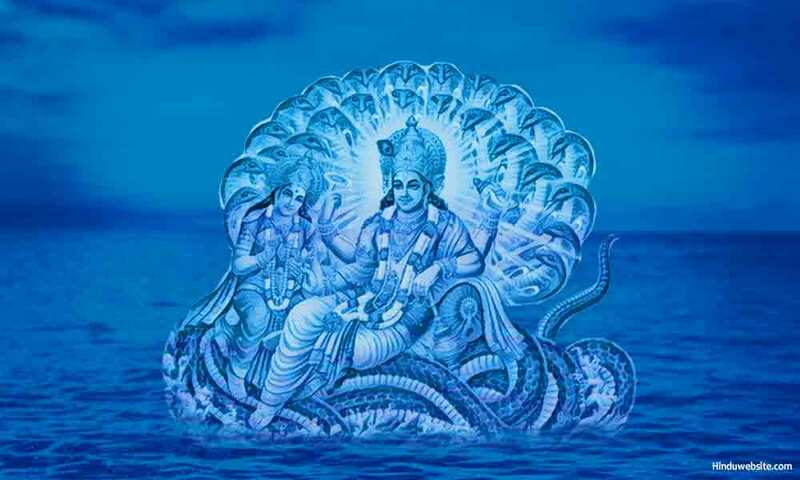 For example, the Puranas describe Brahma as being born from the navel of Vishnu. Vishnu is born from the waters of life as a golden egg (Brahmandam). Hence, he is known as Hiranya Garbha, the golden germ. Shiva is a manifestation of Isvara, as Death (Kala) himself. Vishnu is also described in the Vedas as an Aditya (a solar deity), who was born to Aditi, the mother of all gods. Whatever may be their origin, these gods have a beginning and an end. They also manifested in the past as gods, demi-gods and minor deities. Some of them took birth as humans, animals or mythical creatures. The gods and goddesses of Hinduism are numerous and immortal. They are manifestations of Brahman only, and endowed with one or more of his powers and attributes to enable them to perform certain duties in creation as his aspects, powers or emanations. Each of them may in turn manifest as aspects, gods or demigods, humans or animals, with or without physical bodies. Thus, the goddesses Uma, Lakshmi and Saraswathi and their consorts, the triple gods, have either taken birth on earth or assumed numerous physical and ethereal forms to destroy evil, fight with demons, oblige their devotees, help the gods in heaven or manifest the will of their consorts. Some of the forms are pleasant and some fierce. The same is true with regard to gods in heaven such as Indra, Surya, Varuna, etc. The five Pandavas were the sons of Indra, Vayu, Dharmaraj and the Asvins, born to Kunti, while Karna, their abandoned brother, was the son of Surya. Goddess Ganga gave birth to Bhishma, a great warrior and scion of the Kurus. Thus, the interchangeability between gods and humans in the early days of creation was common. Gods were born upon earth to perform obligatory duties, oblige divine will or resolve some issues of karma. Many seers and sages who were born upon earth were either aspects of gods or gods themselves. The God of Hinduism has no birth, but he participates in the birth of all beings (jivas) as the witness Self (sakshi). According to the Vedas, the individual Self (Atman) is an aspect of Brahman only. Just as Brahman, the souls are eternal, unborn, indestructible, indescribable, infinite, invisible, and without form and materiality. In their purest state, they are either indistinguishable from Brahman or minutely distinguishable, without little or no duality between them. When the individual Self is drawn into corporeality by the power of Maya (Nature), it becomes the embodied Self (dehatma) and goes through numerous births and deaths, without being personally effected or tainted in any manner. While the body of a being is perishable and is subject to birth and deaths, the soul or the Self has neither birth nor death. It is eternal and indestructible. Each living being is a combination of soul and materiality. Their association results in the beingness (jivatvam), which has the characteristics of existence (sthithi), activity (chaitanyam), modifications (parinama), consciousness (citta), diversity (anekatvam) and duality (dvandam). Each being is Isvara in the microcosm, and a universe in itself. Hence, the Vedas compare the head of a being or a person to the highest heaven (suva) and his feet to the earth (bhuh). His middle body is compared to the mid-region (bhuva). His sense organs are described as gods (devas), breath as Vayu and his mind as Indra. The warmth in his body is compared to fire (Agni, his hands and feet to the gods of commonality (Visvadevas), his eyes to the sun and the moon and his embodied Self (jivatma) to Isvara. Thus, each being is God (Isvara) Himself, the infinite hidden within the finite, subject to ignorance, duality, and delusion and bound to the cycle of births and deaths. Although Brahman, the highest God, is unknown, incomprehensible and detached from everything and cannot be envisioned or conceptualized, in exceptional cases he takes birth in the mortal world as an animal, mythical creature or human being and lives upon earth amidst people for a specific period to perform certain tasks. This aspect of him is known as the Avataar, which means an incarnation or God who descends (avataranam) into the mortal world and manifest in physically perceptible form. In creation, this function is assigned to Maha Vishnu, since he is the preserver. According to the Puranas, he has already incarnated several times, and may do so in future also. The incarnations may be full or partial. In full incarnations, his powers remain intact while in partial incarnation only certain aspects of him manifest. Both types of incarnations are temporary and subject birth and death. According to the Bhagavadgita, the purpose of an incarnation is restoration of Dharma and destruction of the wicked. The partial incarnations are meant for specific tasks to facilitate the order and regularity of the world and its natural and normal progression. The incarnation of God is not a metaphorical birth, but a real one. Outwardly, he appears to the world as an ordinary mortal, and only those who are closets to him many know his true nature. In that aspect, he is also subject to all the limitations to which the mortals are subject in the field of Nature. Hence, he may experience modifications of the mind and body, show emotions such as anger and love and form bonds and attachments. Brahman, the Supreme Self, is unborn and eternal. He has no birth and deaths. However, he has numerous aspects, manifestations like the rays of the Sun. Isvara, the Supreme Being and the Lord of creation, is a projection of Brahman. Therefore, he has limited existence. He does not take a physical birth, but he manifests in the field of Nature as a pure reflection or projection of Brahman. The gods and goddesses are immortal, but at times they may take birth in the mortal world or elsewhere as part of their duties to perform certain tasks and help Isvara to establish and uphold the order and regularity of creation. They may also take birth, fully or partially, as warriors, seers, sages and minor deities in the mortal world. The individual selves (atmans), which are aspects of Brahman or Brahman himself, go through numerous births and deaths as embodied selves when they are caught in the cycle of births and deaths. They remain bound to Nature, Karma and suffering until they achieve liberation. Although God has neither birth nor death, occasionally he may incarnate upon earth in physical form by taking birth as a physical being to restore Dharma, destroy evil and reestablish order and regularity. His incarnations may be full or partial. Once, their purpose is served, the incarnations depart from their bodies just as the mortals. Thus, the God of Hinduism cannot be limited by definition, description, function or concept. In any aspect or respect he is and is not. Therefore, nothing can be definitively said about him, whether it is about his form, formlessness, birth, death, duty, appearance, aspects or functions. He is the sum of all as well as nothing. Does God Control Everything In Your Life? Can You Escape From Responsibility? Is Wealth Evil and Sinful? Why Brahma is Not Worshipped in Hinduism?